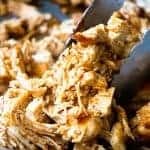 Easy shredded Mexican Chicken.This flavorful shredded Mexican chicken comes together in 30 minutes, start to finish and is perfect for filling tacos, burritos, taquitos, or loading up on nachos or even into a salad. This is my new favorite way to make shredded chicken! In a small bowl combine all of the ingredients to make the chicken taco seasoning. Stir to combine. Coat the chicken on both sides with the chicken taco seasoning. Drizzle the olive oil and heat in a large skillet over medium heat. Add the chicken and let it cook for about 2-3 minutes on each side. Pour in the chicken stock. Cover the skillet and let the chicken cook in the broth for about 15-20 minutes, until the chicken registers 165 degrees internally and is cooked through. Remove the chicken from the skillet, shred using a fork, then return to the skillet. Stir to coat the chicken in the remaining sauce in the skillet. Let sit and keep warm on low heat for about 3-5 minutes, to get good flavor throughout the chicken.